A dominant outing by Johnny Cueto ended the Astros’ season in the Division Series. But this is an extremely talanted ball club that is only going to get better. I had as high hopes for the Astros as anybody heading into 2015, and even I thought that they were another year away. But Carlos Correa, who was the unanimous number two prospect behind Byron Buxton, was number one in my eyes. Boy did he prove me right. 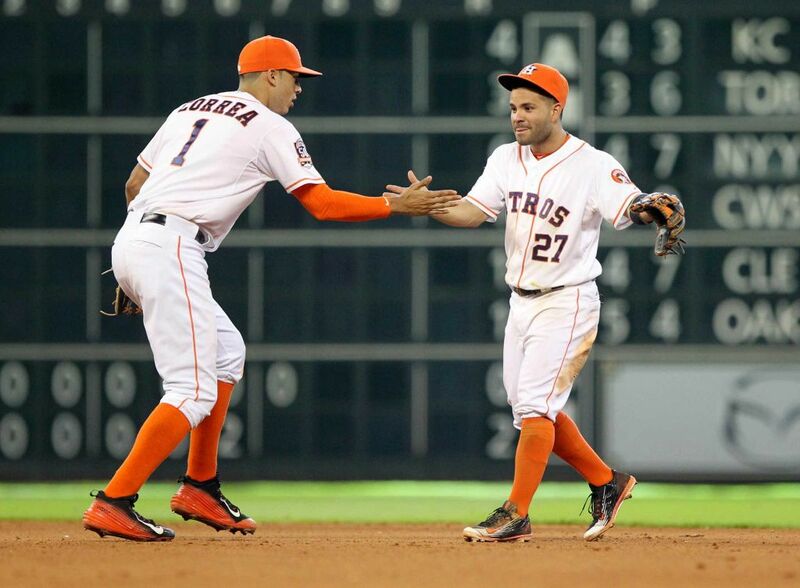 The 20-year old instantly became arguably the best shortstop in all of baseball and paired with the dynamic Jose Altuve to become easily the best middle infield duo in all of baseball. Lance McCullers was another prospect who made an immediate impact on this ball club. Dallas Keuchel did not lose one game at Minute Maid Park all season, and was rewarded with the American League Cy Young Award. They did have a question mark with their bullpen, which came back to bite them in that eighth inning of Game 4, but they solidified that by acquiring Ken Giles from the Phillies. While they did trade five prospects for a reliever, which is an overpay, this is a perfect fit for this team and they still have one of the top farm systems thanks to a dynamic 2015 draft class. The Astros are for real and they are only going to get better. I view this team as the Royals’ biggest threat in their quest for a third consecutive American League Pennant. Jeff Bannister did a stellar job in his first season at the helm for the Rangers. He took a team that dealt with many injuries and led them to the American League West title before falling in five games to the Blue Jays in the ALDS. Adrian Beltre has quietly had a Hall of Fame career and is as steady as they come at third base. I love Rougned Odor at second base. The kid is already one of the best at a thin position. We will see how Ian Desmond will work out in left field, but he bat will be a welcome addition at Globe Life Park. They acquired Cole Hamels at the deadline last season, likely with the future in mind. Now they will have him for a full season to go with Yu Darvish atop the rotation when he is ready to return from Tommy John Surgery. They stole Delino DeShields, the eighth overall pick in 2010 of the Astros and son of the former second basemen of the same name, in the Rule-5 Draft a season ago and he ran with the center field job. This team has guys that will set the table and get on base at the top, produce runs in the middle and two frontline starters atop the rotation. They a solid bullpen with sneaky good closer Shawn Tolleson at the back end. This is a team that will compete for another division title and will compete with the Astros all season long. This is exactly what Major League Baseball wanted when they moved the Astros to the American League in 2013 – a rivalry between the two Texas teams. A lot went wrong for the Mariners a season ago. I was one of many that expected them to compete for a division title, but it did not work out. The organization cleaned house and Jerry Dipoto came in and made his presence felt right off the bat. He acquired Nate Karns from the Rays, Wade Miley from the Red Sox, Leonys Martin from the Rangers, Adam Lind from the Brewers and signed Nori Aoki to a one-year deal with a mutual option for 2017. They also re-signed Hisashi Iwakuma after a three-year, $45 million deal fell through with the Dodgers. In 2014, this was one of the best bullpens in baseball, but was one of the worst in 2015. I think they bounce back. I like the addition of Steve Cishek and think he just had a bad year with the Marlins last year. The king remains the ace of the staff, and he should be nothing short of vintage Felix Hernandez. This team is deeper than it was last season when they fell short of lofty expectations. I think that first year manager Scott Servais will have his team contending in 2016, but will ultimately fall just shy of the postseason. The Athletics had a down year in 2015 after making the playoffs each of the last three seasons (these fans probably still have nightmares of September 30, 2014). After that heartbreaking night for A’s fans, they were unable to turn the page in 2015, losing 94 games. Billy Beane’s magic did not work out, and it might not once again in 2016. He was able to turn Ben Zobrist into Sean Manaea, and that was a fantastic move as the southpaw can make an impact on their rotation this season. I really like the Henderson Alvarez signing. Two years ago, he was fifth in the National League in ERA and he is still 25. I think this can be a steal on a minor league deal. Billy Butler had a down year in the first year of a three year, $30 million deal, and they are hoping that Country Breakfast can return to the hitter he was in Kansas City. Sonny Gray is one of the best and will be a Cy Young candidate. Billy Burns can fly, Khris Davis in left was a nice addition and Josh Reddick is entering his free agent season. He has a gold glove to his credit and should have a big year in 2016. They also added Ryan Madson on a three-year pact, and it would not surprise me if the two-time World Champion ultimately winds up with the closers’ role. Overall, this is a team that I think will be better than last year, but there are questions in the pitching staff and on defense that will hold them back in 2016. It is a real shame that the prime years of one of the best players in this generation is going to waste. That is unfortunately the reality with Mike Trout and the Angels. I really do not see what this organization is trying to do. As amazing of a career that Albert Pujols has had, he has been injury prone and is still set to make $165 million over the next six years. These monster contracts DO. NOT. WORK. I have said it six million times. This is what sends teams’ financial flexibility into the gutter and ultimately, this happens. You cannot do anything without going over the luxury tax threshold, which the Angels refuse to surpass. The pitching is not good. The offense other than Trout is not good, but I seriously question why he ever gets a pitch to hit. Nobody else in this lineup scares me. ESPN’s Keith Law recently called this the worst farm system he has have ever seen, so there is nothing to look forward to. I have no idea what they were thinking when they traded their only good prospect in Sean Newcomb for Andrelton Simmons. How is Simmons going to make this team that much better? They direly need pitching, and Newcomb could be a frontline southpaw fairly soon. It is hard for me to believe that this team won 98 games two years ago and even 85 just last year because this is not a very good team. At all.